Bottle Cages – Arundel Stainless Steel Cage. These cages grip like the Dave-O, (the best cage I have ever used and what I have on my Kuota Kredo race bike) but they fit the personality of this bike with the classic stainless steel look. I’m anxious to take the bike out this evening for a quick spin. I don’t expect the new wheels to impact the performance, but it definitley gives it some more bling. Hopefully the “coolness” factor of the bike will give me some more motivation as I ride it for 112 miles to raise money for the Children’s Medical Center Dallas in 10 days! 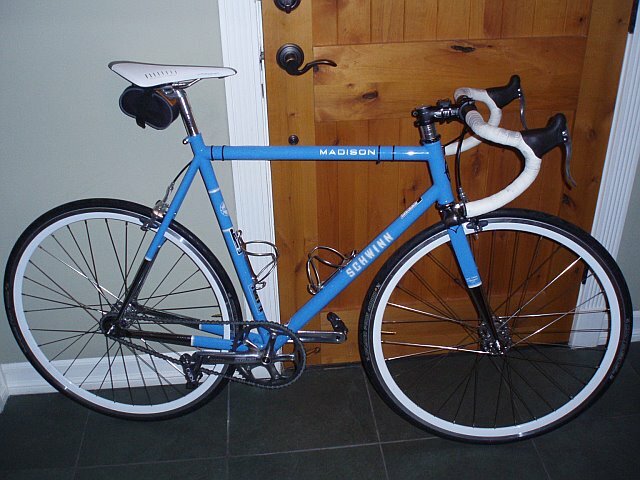 This entry was posted in cycling, fort worth, Uncategorized and tagged arundel, deep v wheels, fixed gear bike, fixie, schwinn madison, single speed, track bike. Bookmark the permalink. Very nice bike. One question: your new Shmano freewheel is 3/32″, no? The Madison is fitted with a 1/8″ system (chain, chainring, freewheeel, fixed cog), is it not? Did you change these parts as well? Or have you gone “hybrid”? Any chainline slop? Noise? I used the Shimano single speed freewheel that is compatible with 3/32″ or 1/8″ chains and I’ve had no issues. No slop, no noise. Only dropped my chain once and it was because my rear wheel nuts and become a little loose.